A mention of Daet to Tutubi will bring back memories of pancit bato and pineapples besides Bagasbas Beach and the first monument of Jose Rizal, remembrances of his first tour of Bicol region during Holy Week of 2003 that took him as far as Naga City (home of the Penafrancia), Legaspi City (Mayon Volcano and Cagsawa ruins) and Donsol (an unplanned trip to see the whale sharks). This time, he returned to Daet, again guided by his close friend, a local from Camarines Norte's capital town, for a long-planned tour of the province, once slated last month, but pushed through recently, to accommodate Tutubi's friends who can't join on the earlier date. Met up at Superlines bus terminal for the 930pm trip (the second of only trips to Daet, the first one is at 9pm), the trip was marred by a flat tire that made the duration of the commute to almost nine hours on the zigzag road (not Bitukang Manok) and arrived in Daet at seven in the morning. 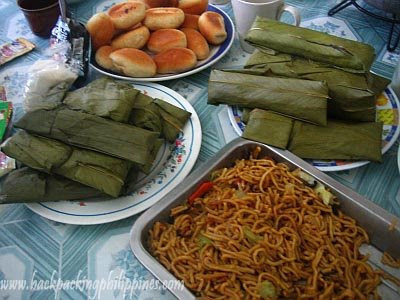 The group had pancit bato and binamban (a cassava delicacy wrapped in leaves) then rested for a while before preparing for lunch and picnic at Club Noah located on the banks of Mampurog River in San Lorenzo Ruiz town, a tiring jeepney ride away on a pothole-filled road with mini-lakes created by the first rain of May. After lunch and short dip at the cold water of Mampurog river, the group decided to go to Bagasbas Beach for pictures, "pseudo" surfing lessons, and beach bum then head for early snack of dinuguan, empanada at K Sarap Restaurant (nice place, low price). 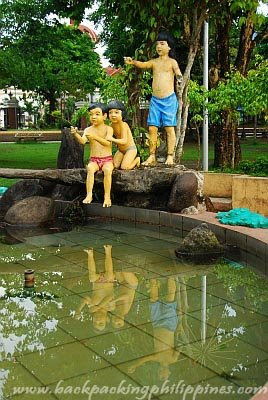 there are no resorts along Bagasbas Beach but hotels, inns and pension houses are available at the town center. Tutubi stayed at the best homestay accommodation there is in Daet: at his friend's house in Brgy. Camambugan, just a few meters away from Superlines bus terminal. Pinyahan Festival (or Pineapple Festival) celebrating Daet's sweet pineapples (formosa variety) and Bantayog Festival (province-wide) in honor of Jose Rizal in mid-March to mid-April. Flights to Daet: there is a small airport but can only accommodate small planes like SeAir with has direct flights from Manila. If you need to fly in a bigger plane, you need to book a flight to Naga City in Camarines Sur then take a jeepney or bus for a two hour trip to Daet. Naga is serviced by Philippine Airlines, Cebu Pacific and Air Philippines. Driving directions: from Makati, head to SLEX and exit at Batangas follow Maharlika highway going to Lucena City. Look for any bus heading to Daet on the highway where you'll also pass by these towns: Pagbilao, Atimonan, Plaridel, Gumaca, Lopez, Calauag, Tagkawayan, Sta. Elena, Talisay, Labo, then finally Daet. we passed by this place when we went to Bicol. we had a stopover (about 30minutes rest) since we drove going to Bicol. as to what i know this is also the drop point when you go to the Calaguas island. Woot! I love your posts, really interesting. we went to tabaco once. I don't know if we passed this place becauce we travelled by BLTB night trip. We visited Geothermal Station in Pili Albay and mayon volcano... that was 1990.
everyone seems to be heading in the Bicol region these days. i was there last week, hehe. ang saya! Looks like a pretty hearty breakfast to me. elaine, i noticed there are no resorts on bagasbas, there are only bars and restaurants with facilities for you to take a shower or toilet/CR. my friend there suggested pineapple resort with swimming pool though. Ooh, you've gone to Bicol! Sabi nga ni Rayts, everyone's heading to Bicol these days. But this Bicolano hasn't been there in quite a while, di ko tuloy nasabayan yung ibang friends ko. Anyway, about Daet, it's usually bypassed nowadays due to the Maharlika(?) Highway that directly connects the province of Quezon with Camarines Sur. But with potholes and roadworks plaguing this highway, it would be easier on your vehicle when you travel by the winding yet well-paved roads of Camarines Norte. More in this entry of mine. 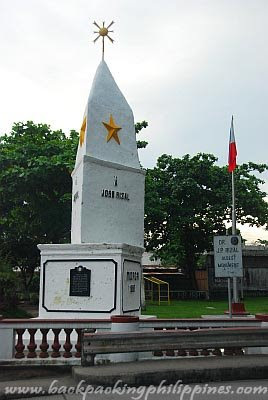 napansin ko lang po dun sa rizal monument ng daet,since im from this place yong nasa tuktok po kc nyan ay originally ay moon bakit po pinalitan na ng star? just asking,coz i believed we must preserve our one historical icons,still dun pa rin sa first rizal monument ng daet. thanks! we plan to go, from bagasbas to caramoan. is it easy to find homestays/accomodations in the caramoan area? Can you please email me at info@sefdesign.com? I'd like to use one of the photos from this blog. Hi! I've been in daet so many times... There was a hotel and resort in daet named pineapple resort but it takes 30 mins to travel from the market place and if you want more accessible hotel and resort you can go to villa mila resort or wiltan hotel, these resort are located along the highway. I have friends also living there... til next time! Hello, how long is the stopover in Antimonan? paolo, it's about 20 minutes. you get comfort break and snack/meal there. try d mananap falls in san vicente.. DAET......I never stopped being amazed of this place. Although not as scenic as other provinces, Daet will surely tell you what a provice is all about! I have been to Camiguin, Marinduque, Baguio and some more provinces but Daet provides a more comfortable nest especially when you talk about spending. Having a simple Laing, Bicol Express, Sinantol or even just a Daing na galunggong will satisfy your stay in this place. Daet....... I LOVE YOU SO MUUUUUCH!!!!!!!!!!!!!!!!!! looks good in picture, some kind deceiving igwa kami bad experience ng family ko when we had our overnight stay there. be careful with their charges the higher room you get the higher entrance payment they collect.... its very disappointing for us that time coz were looking for a better place (relaxing) to stay so we spend overnight there at first swimming is on our mind but since we already been in an island in jose panganiban and enjoy snorkeling we felt tired to go for a swim but instead enjoy videoke. morning comes all seems not in the mood to swim so we decided to check-out and ask for our bill. and i was surprise of their voluptuous charges at first they charge us for 2 rooms, obviously staff lacks communication since we only use one. so they amend the charges but still surprise me. we just ignore that their rate is like hotels in manila since they charge us P3,500 for 12 hrs. Comparatively in manila you can stay for 24hrs stay plus access on whatever amenities they have for free. in Pineapple Resort they will not only charge you with Voluptuous room rates but also charge you with swimming entrance fee which is PHP100 higher than actual night rate of PHP150, in other words we pay PHP250 each though we never use the pool and incase we use it were only allowed until 11pm which is quite unfair since we pay for overnight rates. PAYING IS NOT AN ISSUE but deceiving guest and giving a surprise charges will not give good reputation in your business. the place are still undeveloped except for pool area, rooms are old that fact that painting is chipping. we arrived 7pm and the place looks like a ghost town since were the only guest and very few lump post. it looks like their not expecting us. it looks good in picture, some kind deceiving igwa kami bad experience ng family ko when we had our overnight stay there. be careful with their charges the higher room you get the higher entrance payment they collect.... its very disappointing for us that time coz were looking for a better place (relaxing) to stay so we spend overnight there at first swimming is on our mind but since we already been in an island in jose panganiban and enjoy snorkeling we felt tired to go for a swim but instead enjoy videoke. been to baguio a lot, laguna, cebu and boracay. but my heart belongs to daet. i luv to travel. i luv nature. went to daet the first time for a weekend via philtranco, second time via plane and this weekend via philtranco. am an adventurous traveler. daet has a simple way of living and so i am. see u daet very soon. Have fun under the sun at San Antonio (Labo) Recreactional Resort!